Influenza victims crowded into an emergency hospital near Fort Riley, Kansas in this 1918 file photo. 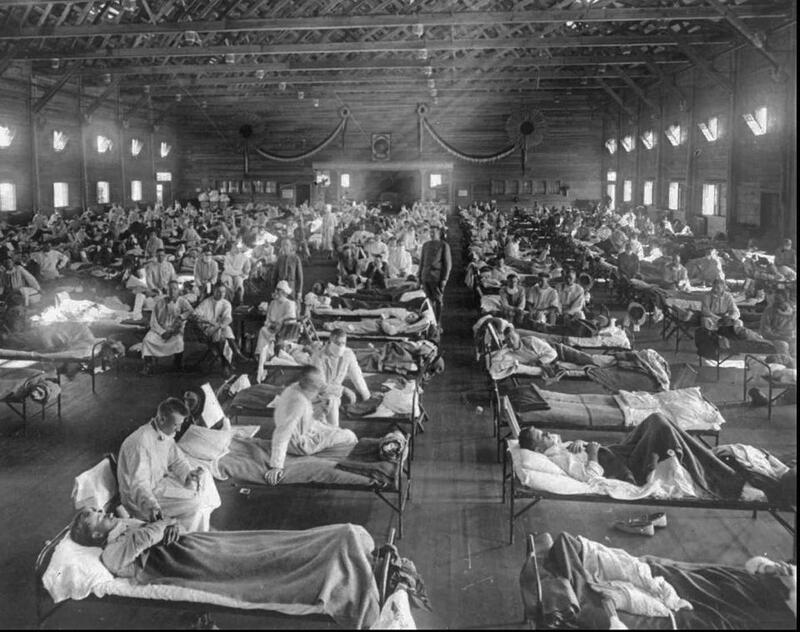 The 1918 Spanish flu pandemic killed at least 20 million people worldwide. How does a nation fight, simultaneously, a worldwide war and a pandemic? One hundred years ago, as the United States rushed servicemen to the Western Front, a new influenza strain swept the home front. The first signs came from military training camps nationwide, which reported uncommonly severe pneumonia spreading in young adults. Civilians were soon affected, and big cities like Boston, Chicago, and Philadelphia would be hit especially hard. Officials shuttered theaters and dance halls, public schools were closed and repurposed into makeshift wards, hospitals and their few healthy staff were overwhelmed. Within the pandemic’s first 25 weeks, an estimated 25 million people had lost their lives around the world. As 2018 has come to a close, the memory of the remarkable crisis of the 1918-19 influenza pandemic looms large over public health practitioners. On this centennial anniversary, we must ask: Are our tools, systems, and collective mindset prepared for the next pandemic? First, the good news. This past century’s collective commitment to America’s science engine — its “Miracle Machine” — has resulted in unprecedented growth in our understanding of infectious disease. We now have an arsenal of new tools to detect, treat, and prevent influenza and a multitude of other pathogens. Rapid flu diagnostics can return results as quickly as pregnancy tests, antivirals such as oseltamivir (Tamiflu) offer a treatment option to patients diagnosed early, antibiotics can ward off secondary bacterial infections, and the pipeline for designing and producing a seasonal vaccine protects millions each year. A coordinated network of labs test more than 1 million specimens each year for influenza, and over 2,800 outpatient centers gather data on influenza symptoms. We have indeed come a long way. Remarkably, in 1918, we were not even clear about what was causing the epidemic. The culprit was at least understood to be contagious — as opposed to environmental — but the influenza virus would not be isolated for another 13 years. 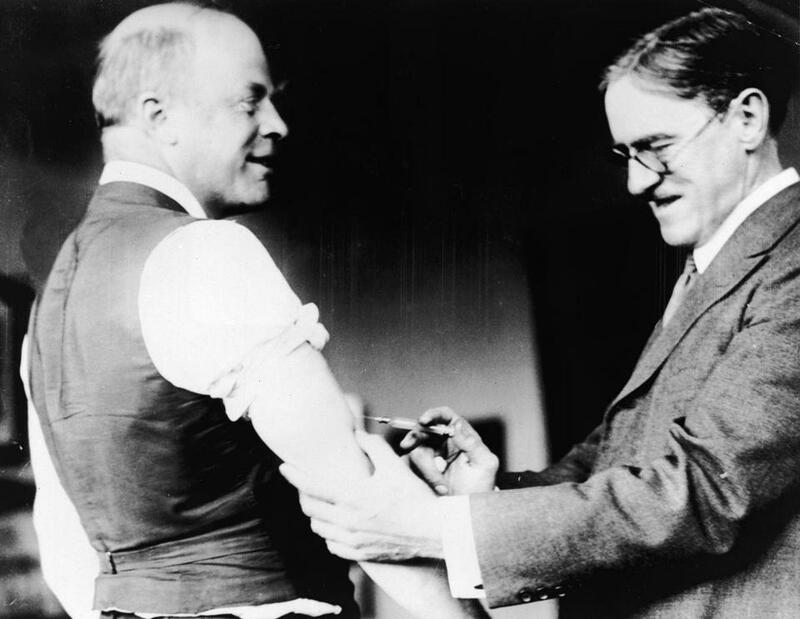 This mystery alone made informative testing and effective vaccines impossible at the time, though profiteers still peddled vaccines against unrelated microbes. Confirmed cases increased from 1,298 during last year’s flu season to 2,194 so far in the current flu season, according to statistics from the state. Health care agencies also lacked cohesion in 1918. Newly empowered city and state health departments oversaw the public’s health, but there was no network to collect the data and sound the alarm. Closed and controlled communities, such as military barracks and prisons, provided the only hints of the epidemic’s beginnings in the spring of 1918. Despite the technical and organizational progress of the last century, the risk of a global pandemic still remains high. More people than ever live in or near dense, hyperconnected megacities. A highly pathogenic and transmissible flu strain — or other undiscovered pathogen, natural or man-made — could circumnavigate the globe in weeks. As safeguards, our tools and systems need upgrading, and urgent investments remain important. Masked Red Cross workers made gauze masks during the plague of Spanish flu. We need a firm commitment from the international community to the science to develop new diagnostic tests for all infectious diseases anywhere in the world. Even in the most advanced hospitals, the vast majority of infections remain undiagnosed, and patients and clinics are often disconnected from what may be going on around them. The recent Ebola and Zika outbreaks circulated for months under our radar before they were properly tracked. We need new therapies (such as the experimental drug favipirivir), and multidrug combinations need to be developed and approved for flu, because highly mutable viruses like flu can develop resistance. The flu vaccine pipeline, while a time-tested and well-oiled machine, still takes six to eight months for production, and too often the vaccine misses the mark due to changes that occur in the virus in nature and during egg-based manufacturing. 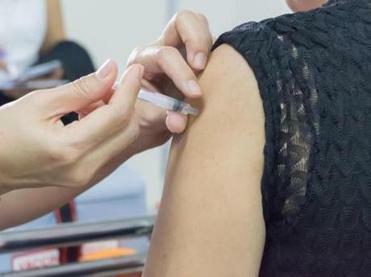 Many researchers are pursuing the holy grail of flu prevention: a universal vaccine that will protect against many flu types for many years and alleviate the need for annual shots. We need applications that can link patients to their health care network. And systems that connect clinics across an organized network and empower health care workers on the front lines to harness the next generation of tests and treatments. When you become sick you should know what you have, how it connects to your community, and what to do next. We also need a different mindset. The isolation rhetoric in the current political climate is dangerous. Microbes don’t recognize borders; walls won’t work. Isolationist interventions would provide little safekeeping for most large and connected nations such as ours. Individuals’ trust in the health care establishment is also at a dangerous low, with only just under half of Americans receiving flu vaccines each year, and a growing antivaccination movement. The problems introduced by outbreaks never occur in isolation. They layer atop other ongoing challenges, large and small, from military combat to everyday troubles. 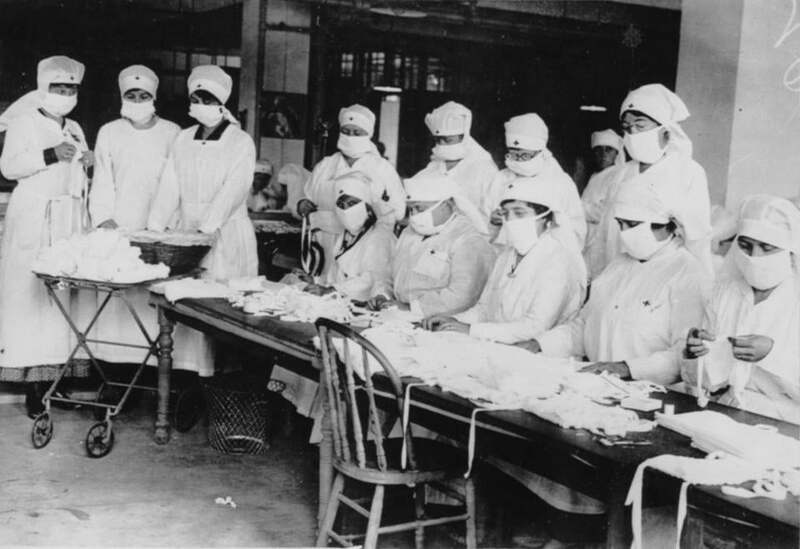 Conflicting priorities will shortchange public health decisions, just as the unremitting war mobilization in 1918 enhanced the spread of influenza. If our society’s vulnerabilities are its fault lines, outbreaks crack and open fractures. We therefore need to have capable tools, resilient systems, and a cooperative mindset in place to respond when the moment arises. The Allies declared victory on Nov. 11, 1918, but the flu fight ended in failure. In the end, the costs of the 1918-19 flu pandemic were staggering — rivaling even those of the Great War. Worldwide, an estimated 20 million to 100 million people died from flu, as much as 5 percent of the world’s population — one of the deadliest natural disasters in human history. However insurmountable our wider troubles seem now or may become, we cannot relinquish our commitments to science, our public health systems, and each other. Let’s mark 2018 for how far we’ve come and push for the goals for outbreak preparedness that are now within reach. One hundred years ago, as the United States rushed servicemen to the Western Front, a new influenza strain swept the home front. Nathan Yozwiak is drector of Viral Genomics at Ring Therapeutics, Inc. Pardis Sabeti is a professor at Harvard University and Harvard School of Public Health and an institute member member of the Broad Institute.